– O’Neill holds first elite women’s World Tour event in history at Sunset Beach. For the first time in the history of women’s professional surfing, O’Neill is proud to present an ASP World Tour championship event: The $100,000 O’Neill Women’s World Cup of Surfing, the second stop for the ladies in the Vans Triple Crown of Surfing. The women’s event will run parallel with the long established men’s O’Neill World Cup of Surfing. The holding periods both begin tomorrow, November 24, through Monday, December 6 at Sunset Beach. The O’Neill Women’s World Cup of Surfing will determine the elite lineup of women for the 2011 ASP Women’s World Tour, and the men’s event will be the last chance for rising stars to qualify for the 2011 men’s tour. Heading to Sunset, Australia’s Joel Parkinson will be looking to defend his 2009 O’Neill World Cup of Surfing title, along with the Vans Triple Crown win he clinched last year. Australia’s Stephanie Gilmore leads the women’s Vans Triple Crown race after her victory last week, and having already claimed the 2010 ASP World Title, she is looking to cap off a stellar year with a golden finish before heading home for Christmas. A strong showing at Sunset Beach will also be critical to ensure a berth in the Vans Duel for the Jewel at Pipeline, starting December 8th. Only four women will qualify for the final stage at Pipe, based on combined results from Haleiwa and Sunset. Surfline.com, the official forecasters for the Vans Triple Crown, anticipate a NW swell to start filling in tonight, which will likely see competition get underway promptly at 8am tomorrow. 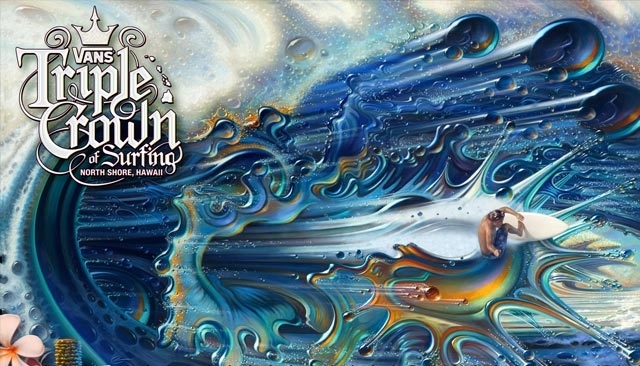 Live internet coverage of the O’Neill World Cup of Surfing happens every day, starting at 7:45 a.m. with “THE CALL” – the Triple Crown’s live daily morning show that features all the latest news, highlights and happenings. The series will also be broadcast live on television around Hawaii on Oceanic Time Warner Digital Cable channels 250 and HD1250. The Vans Triple Crown of Surfing consists of three men’s and three women’s professional surfing events that are the final stop on the 2010 Association of Surfing Professionals (ASP) World Tour. Now in its 28th year, the Vans Triple Crown is considered the most prestigious title in surfing next to the ASP World Title. Each event has an extended holding period with competition taking place on the biggest and best days of surf at each venue.